Q: I am working with foster youth to complete their FAFSA by the March 2 deadline. How do we know it was successfully submitted and received? A: The FAFSA form will be processed a few days after submission, and it will be indicated when you log back into FAFSA. For additional resources on completing FAFSA, please review the Financial Aid Planning Guide. Q: I was awarded a Cal Grant to attend community college, but my counselor is telling me I shouldn’t take the money because it could run out later. Could you explain why I wouldn’t want to accept this money? A: Currently, the Cal Grant is available only for a maximum of four years of full-time enrollment at a community college, CSU, UC or private institution. At a community college, the grant provides up to $1,672 to cover non-tuition costs, such as books, housing and transportation. At a 4-year university, the money can also be used to pay for tuition costs and therefore provides significantly more: up to $7,414 for a student attending a CSU campus, $14,302 for students attending a UC campus and $10,756 for students enrolled at a qualifying private institution. If you utilize the funding while in community college, you run the risk of not having enough funds remaining when you transfer to a university and when the available benefit is significantly more. Q: How do I know if I qualify for independent status on the FAFSA, and what exactly does it mean to be an independent student? A: “Independent Status” on the Free Application for Federal Student Aid (FAFSA) means that youth do not have to provide any information, including income and asset information, about their biological, adoptive, or foster parents (including relative or non-relative caregivers) or legal guardians in the Parent Demographics section. This will mean that parental contribution is not added into a student’s contribution to determine his or her Estimated Financial Contribution (EFC), the index number that determines how much a student can pay for education and how much financial aid students receive. 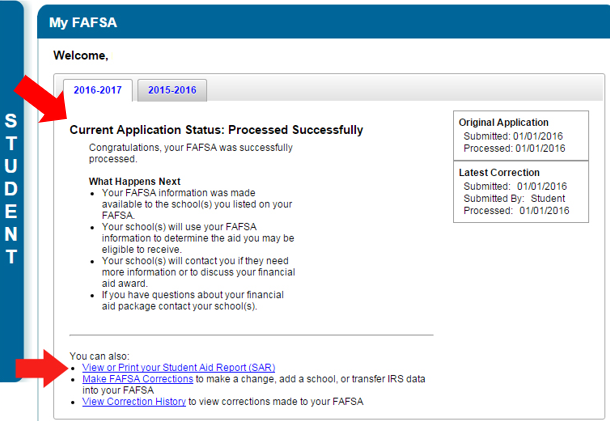 Q: I am completing the FAFSA and on the page where I indicate which schools I want my information sent to, it asks me to indicate if I will be living on-campus, off-campus or with parents. I am currently in foster care and have lived with my aunt since I entered the system, and I plan to continue living with her while I go to community college. Which option do I select? A: You would select “off-campus.” Students should not select “With Parent” as their housing plan if they plan to live with a foster parent, relative caregiver, or legal guardian. Instead, select “Off-Campus.” This is crucial for getting all the money that is available to you to pay for your living expenses. The option you select has an impact on how much money you receive as the “cost of attendance” is considered more when living off-campus than when living with a parent. For more tips on how to complete the FAFSA, check out the Financial Aid Guide for California Foster Youth. Q: We are working with a youth who would like to reenroll in community college, but has incurred student debt from when he enrolled and received the Pell Grant, and then dropped out and did not pay the financial aid back. He reports that the debt has gone into collections. Will he be able to reapply for financial aid? Any advice on how to deal with the debt so he can reenroll in school? A: If the debt he incurred was from federal financial aid such as the Pell Grant and it has gone to collections, then he will have to at least begin to make payments before being able to apply for any other federal financial aid (regardless of the school he enrolls in). The student should call the phone number on his Student Aid Report and ask how many payments he must make before the hold can be lifted. The collections office his debt has been referred to will inform the Department of Education (DOE) if the student is making payments. The DOE can issue a letter to the student or school, and at that point the school can override the hold for the student to receive the Pell Grant again. It is also good to know that if the student calls the collections office and indicates he would like to pay his debt in full, they will usually discount the payment amount for the student if the student asks. For future reference, if the student was able to catch address the debt before it went to collections, he may have been able to make “satisfactory arrangements” with the school, where the school repays the debt and makes arrangements with the student for repayment. Many schools are willing to use future aid to pay off debt. Q: I’m working with a foster youth in community college who is receiving the Board of Governors (BOG) Fee Waiver. His Grade Point Average has been below a 2.0 for two consecutive semesters now. I understand that the BOG Fee Waiver now has Satisfactory Academic Progress (SAP) requirements. Will this youth lose his fee waiver? A: No, if he is a foster youth, he will not lose his BOG Fee Waiver for failure to maintain Satisfactory Academic Progress (SAP). While there is a requirement that BOG Fee Waiver recipients must maintain at least a 2.0 GPA and greater than a 50% Completion Rate, current and former foster youth under age 25 are exempt from BOG Fee Waiver Disqualification. Q: I’ve been receiving the Pell Grant for six years – I spent several years attending community college part-time, then transferred to a 4-year where I have one year left before getting my degree. I was told that a student can only receive the Pell Grant for 6 years / 12 semesters. Does this mean I cannot receive the Pell for my 7th year in college? A: No, this does not mean you will lose your Pell Grant in your 7th year. A student can receive the Pell Grant for 6 full-time-equivalent years (12 full-time-equivalent semesters) as an undergraduate. Since you were not attending college full-time for each of your 6 years, you should still be eligible for some Pell in your 7th year. For example, if you attended half-time (6 units each semester) for your first 2 years of college, you would have used only 1 full-time-equivalent year of Pell during those 2 years. That would leave you with 1 more full-time-equivalent year of eligibility—enough for your final 7th year. How can you know for sure how much Pell eligibility you have left? When you file a FAFSA, you receive a Student Aid Report that will give you a general idea of how many of your 6 full-time-equivalent years of eligibility you have already used. For more specific information, you can log in to the National Student Loan Data System (NSLDS) at https://www.nslds.ed.gov/nslds/nslds_SA/ (click on “Financial Aid Review” and set up an account, if you haven’t already). It will show you the percentage of Pell eligibility that you have already used. The cut-off point is 600% (that is equivalent to 6 full-time-equivalent years). Example: If it shows you have used 400% of your Pell eligibility, you would have 200% (or 2 full-time equivalent years) left. For the most up-to-date information, you can contact your college’s financial aid office. Q: I’m a Court Appointed Special Advocate (CASA), helping my youth fill out the Free Application for Federal Student Aid (FAFSA) and Chafee application, and want to make sure he selects a major that is financial aid-eligible. I don’t see this information on the FAFSA website anywhere. Where can I find this? A: You are correct, it is not listed on FAFSA website. There are three ways a student can learn whether a major is financial aid-eligible. Before applying, a student can look on the college website where they are planning on attending. Financial aid-eligible majors should be located on college websites or district websites. For example, for the Peralta Community Colleges, it is located here: http://web.peralta.edu/financial-aid/sample-page/financial-aid-approved-academic-programs/. When the student applies for community college through CCCapply and selects his/her major, next to the major it will state ‘financial aid eligible’ or ‘financial aid ineligible’. After the college has received the student’s financial aid package, the college will contact the student to let them know that their major is financial aid-eligible, or financial aid-ineligible.